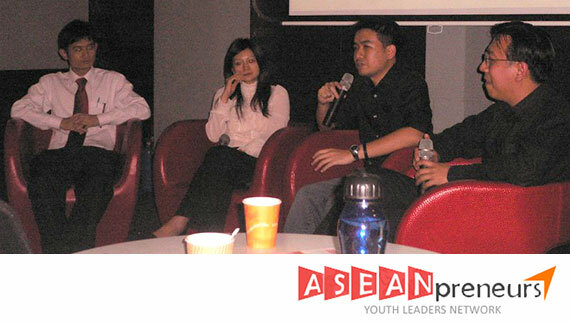 On Tuesday, March 3, 2008, I was invited to be one of the panelists in the ASEANpreneurs’ Alpha Challenge Networking Event in Singapore. This event is a scenario-based competition whereby participants are expected to harness the power of media to spread the stories of successful entrepreneurs in ASEAN amongst the region. The networking event was held in Geek Terminal, whose CEO, Christopher Lee, was also one of the panelists. Joining the panel discussion as well was Janice Tseng, a spokesperson in behalf of Donut Empire, Singapore’s fastest growing donut outlet. Spanning for a couple of hours, the event features a series of agenda, including a keynote presentation from Christopher Lee, the panel discussion, as well as a free networking session afterwards, of which we can discuss freely with the participants that attended the event. More photos of the event can be found here, while more information about the program can be found here. On behalf of Neuro-Designs, I wish the event to run smoothly and that this can be a major turning point for ASEAN’s potential young entrepreneurs.